Rose fragrance notes: This delicate Rose scent is balanced with fresh dewy notes and a sweet softness to create a sensual and alluring feeling. 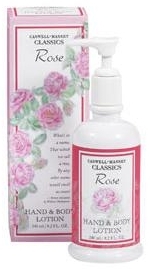 Pamper yourself with our creamy rose-scented body lotion that will moisturize your skin, leaving it soft and silky. For best results, moisturize and scent your body after a bath or shower when skin is slightly damp. Beautifully boxed; 8.2 fl oz pump dispenser.